This was a standard rebuild on an existing engine platform with no additional modifications for power. The primary consideration was reliability and clean running. When we originally received this engine for rebuild (we have done it twice now over a period of years), it had broken the timing gears so we didn't have a baseline dyno run. 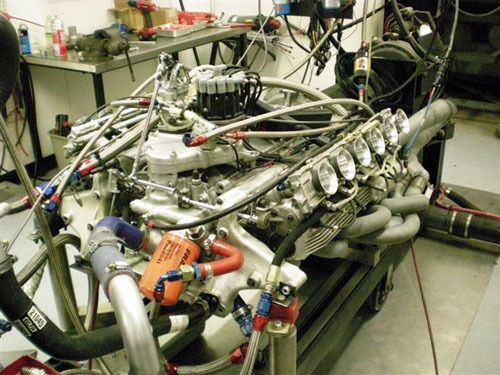 After the ﬁrst rebuild, it was run on a chassis dyno (our original DTS engine dyno couldn't handle the quick rpm changes) and produced 289 HP @ 9000 rpm. After the second rebuild (re-fresh), we ran it on our new Superﬂow Powermark dyno and saw a deﬁ nite improvement (365 HP @ 9,800). 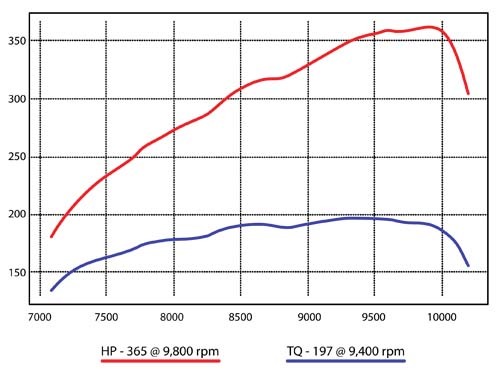 Most of the improvement was due to fuel curve tuning on the Lucas mechanical injection system and ignition optimization. While not the most powerful vintage F1 engine, it has been very reliable and smooth. Induction: Lucas mechanical fuel injection with slide type throttles.